Long-term storage of cryopreserved hematopoietic cells and their recovery after thawing are of critical importance in both traditional and novel cellular therapies. The increasing use of traditional hematopoietic cell therapies—as well as the emerging potential of novel regenerative medicine therapies—highlights the importance of the cryopreservation process and its impact on cell yield, viability, and function. 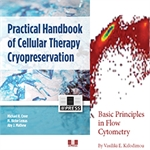 The Practical Handbook of Cellular Cryopreservation explains the “nuts and bolts” of the cryopreservation process from beginning to end: which freezers are used for which products, the fundamentals of freezing cells without damage, how to read freezing curves, how to handle products after an abnormality occurs, when to validate/verify/qualify, and so much more. This volume is packed with color illustrations that bring additional clarity to the detailed discussions. 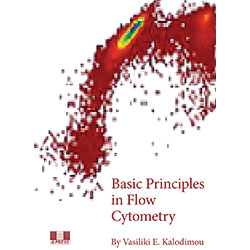 Basic Principles in Flow Cytometry introduces readers to the principles of flow cytometry and flow cytometer operation, as well as cell proliferation, labeling, enumeration, analysis, and apoptosis/cell death. Flow cytometry was initially used in the diagnosis and treatment of malignant diseases. Its use has broadened to include other areas, such as fetomaternal hemorrhage, immunodeficiencies, paroxysmal nocturnal hemoglobinuria, cellular therapy, and genetic variation to name but a few. Unlike other laboratory devices, flow cytometers present the technologist with many different settings for their use. This book is intended as a primer to help the novice understand the basic principles of this evolving technology and provide a foundation for further study.